Please watch patiently to see the animation. Osteocytes (within the lamellae) are not shown. These images illustrate the process of bone remodelling. Osteoblasts lie alongside the surface of the channel, where they are laying down new lamellae. They follow after the osteoclasts, rebuilding the bone (and thereby storing calcium). Eventually most of the space, except for a narrow Haversian canal, will be occupied with fresh bone. A balance between osteoclast and osteoblast activity is necessary for a stable calcium level in blood. To this end, osteoclast activity is hormonally regulated, stimulated by parathyroid hormone and inhibited by calcitonin from C-cells of the thyroid. 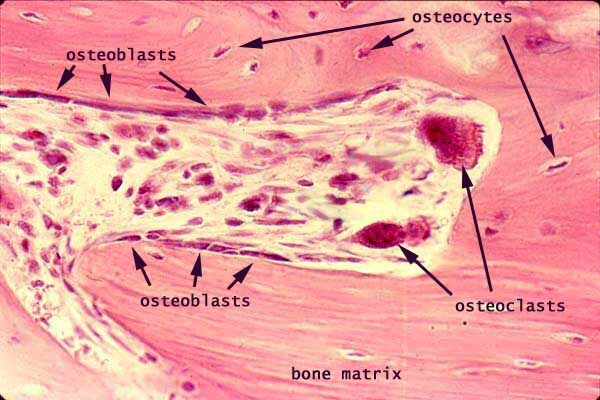 Osteocytes are embedded in the bone matrix, each within its own lacuna. As remodelling proceeds, osteocytes are alternatively freed and then re-imprisoned. Lamellae lie parallel to freshly-formed surfaces (i.e., immediately beneath the osteoblasts), but are cut arbitrarily by osteoclast activity.